RYAN GIGGS PREDICTED a “magnificent” future for Ethan Ampadu after the 17-year-old thrived in a 4-1 Nations League win against Republic of Ireland. Real Madrid star Gareth Bale scored a stunner and created a first Wales goal for Connor Roberts but it was Ampadu who caught the eye in a midfield role on Thursday at Cardiff City Stadium. The teenager, making his third international appearance, was involved in two goals as Wales ran riot in their Nations League opener, which was the first competitive match in charge for Giggs. “Ethan is a talented player,” Giggs told Sky Sports. “Even more so than that, as a person he is so balanced, so mature, for such a young player – he’s going to be magnificent. “The lads were magnificent, some brilliant goals and great football. I can’t be much happier. At the start of the season it’s about juggling players who are playing regularly with match rhythm with a balance of experience and bringing young players in. Ireland were unbeaten in their last eight meetings with Wales but collapsed to a second successive heavy defeat in a competitive game, having been thrashed 5-1 at home by a Christian Eriksen-inspired Denmark in last November’s World Cup play-off. And while Giggs was thrilled by the display of his young side, Ireland coach Martin O’Neill bemoaned being without key senior players including Harry Arter, Robbie Brady and Shane Long for the trip to Cardiff. “We were well beaten and it’s difficult – yes, missing some key players, but still well beaten,” O’Neill told Sky Sports. “I think obviously we set out with good intentions but they scored early, second goal from a world-class player [Bale], a world-class goal sets you back – 2-0 down, 15 minutes gone it’s a tough way back. It was a hard evening. “We were unable to be missing five or six Premier League players and still put on a good show, we need to be at full strength. We can be, but I’m not sure when we have been, but I can’t remember when we have been as decimated as this. Email “Ryan Giggs delighted with 17-year-old star Ethan Ampadu and 'magnificent' Wales”. 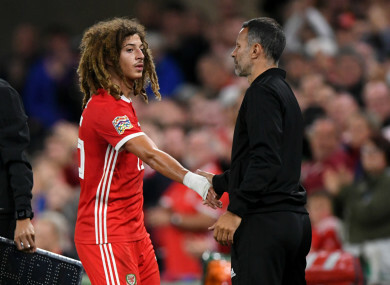 Feedback on “Ryan Giggs delighted with 17-year-old star Ethan Ampadu and 'magnificent' Wales”.